Wash beets and remove any whiskers or greens that aren’t pristine (you can leave the tops on – they’re delicious too). Place beets in the center of a square of tinfoil. Add a garlic clove (or scape) and any herbs that are your favorites. Salt and pepper. Gather up the foil and seal. 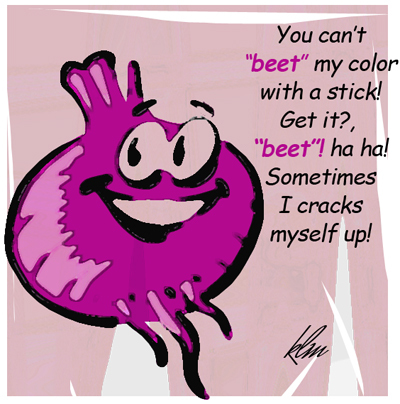 Place beet packets on a cookie sheet and roast in the oven for around an hour, depending on the size of the beets. You can also place the foil packets on the grill and roast til tender. Eat immediately as a delicious side to fish or chicken or cube and mix with quinoa or farrow. Or throw them in the fridge for tomorrow. Once cool, you can simply wipe the skins off with a paper towel… this is the easiest way to peel a beet! Slice and add to a green salads or drizzle with olive oil and balsamic vinegar then sprinkle with feta cheese for a deliciously simple salad. And if you get beet juice on your fingers, just smile and let everybody think you were caught red handed.